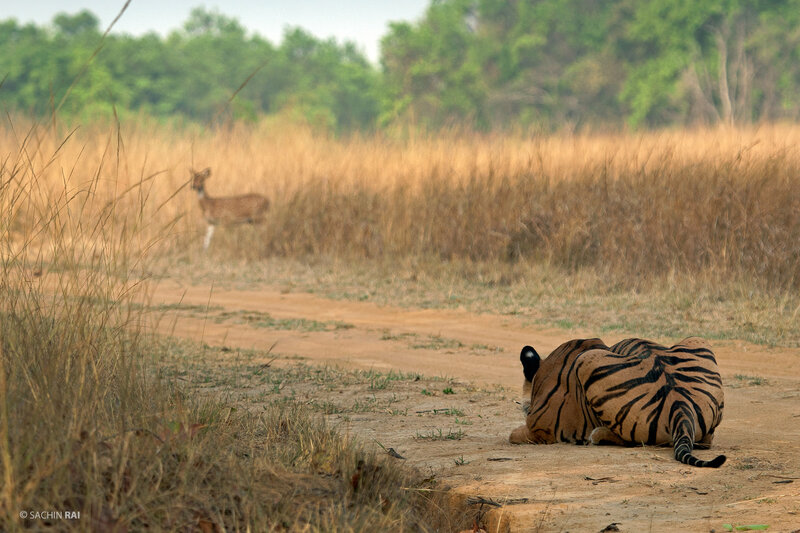 This young tiger was trying to establish a new territory after being ousted from his father’s territory. He would spend a lot of time in the grassland, which was new to him and was thriving with a numbers of prey species. As we were driving through the area, we found him sitting in the middle of the road, eyeing a spotted deer that was about to emerge from the grasslands. He immediately crouched in the hope that the deer would take no notice of him. Unfortunately, as there was no shelter to hide behind, the deer quickly perceived the stalking tiger and sped away.